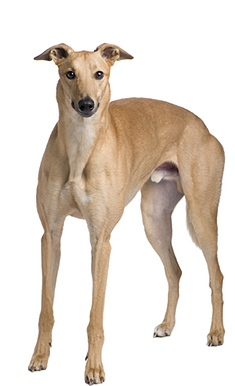 Slim and graceful, the Greyhound's streamlined body allows it to excel in running. Greyhounds have a curved spine and folded-over rose shaped ears. Their front legs are straight and their back legs are very powerful. Greyhounds originated in the Middle East. Greyhound males are 28 to 30 inches (71 to 76cm). 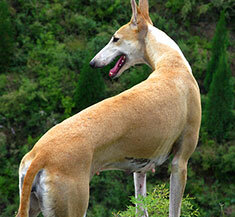 Female Greyhounds are 27 to 28 inches (68-71cm). Greyhound males are 65 to 70 pounds (29 to 32kg). Female Greyhounds are 60 to 65 pounds (27 to 29kg). Greyhounds may be any color, solid or multi-colored. The Greyhound's short smooth coat should be brushed as needed. This breed is an average shedder. Rubbing the greyhound's coat with a chamois will make it gleam. Sweet and loving, Greyhounds make excellent companions. They are gentle and even-tempered and should be socialized early to avoid timidity. Greyhounds are very loyal and love their masters and their families. Ex-racers also make good pets and are easy to housebreak. Greyhounds can get sores from being made to lie on hard surfaces. They are prone to bloat, sensitive to insecticides and should only be fed 2-3 small meals a day. Greyhounds can be expected to live about 10 to 12 years. Greyhounds love routine and should be allowed to run free at least once a day. They can do well in an apartment with plenty of exercise, and are relatively inactive indoors. Greyhounds are in the Hound Group. Who hasn’t been enamored at the sight of a majestic Greyhound running at full tilt? The dog is, quite simply, built for speed. What does a Greyhound look like? If you’ve never had the honor of meeting a Greyhound, you are missing quite a beautiful sight. Standing 26 – 30 inches tall at the shoulders, and weighing 60 – 90 pounds, these dogs have a skinny body and very deep chest to allow extraordinarily efficient lung function. Wide nostrils allow him to take in the maximum amount of air possible, and his small ears can be aerodynamically folded over so as not to cut down on his speed. Long, skinny legs and great musculature complete the picture of a dog who knows no better activity than running. The short-haired coat of Greyhounds comes in just about any color known to the canine world. Using the basic colors of fawn, brindle, black, white, red, and grey (sometimes called blue), the coat may reveal any of up to 30 unique color combinations. The coat is soft and fine, requiring very little grooming. His skin is also very thin, and can be easily torn. Even though daily brushing isn’t required for the coat, it isn’t a bad idea to look your Greyhound over thoroughly each day, checking for nicks and cuts. Companion Greyhounds are often provided with soft bedding to prevent the development of painful skin sores where the soft skin touches a hard surface. What are Greyhounds used for? Greyhounds probably originated in Eastern Europe, although they are similar in appearance to dogs shown in pictures from as far back as ancient Egypt. They were used primarily for hunting the British Isles, using mostly their keen sense of sight. 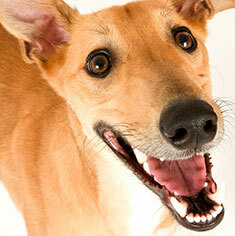 Today, Greyhounds are used for three things: racing, lure coursing, and companionship. Dog racing has fallen into social disfavor in recent years due to the abusive treatment racing dogs may receive such as being crated in small enclosures, run hard until they can no longer produce winnings, and destroyed when they reach the end of their useful lives. Greyhound rescue organizations now exist in most states to remove dogs from the racing environment before they are destroyed. 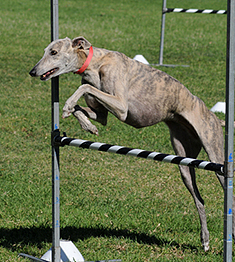 Lure coursing makes use of the dog’s natural sighthound abilities to run the dog through a pre-set timed course by having him follow an artificial lure which runs on a wire beside the course. The dog who takes the least amount of time to run the course is declared the winner. The American Sighthound Field Association (hotlink to http://www.asfa.org/) sponsors and sanctions lure coursing events in North America. The short answer is: absolutely! They get along well with children, dogs, and any other pets that may be in the home. Rescued Greyhounds have been taught to chase a lure, and may decide to chase small housepets unless taught otherwise. In addition, because former racing Greyhounds were often confined when not racing, they may suffer from separation anxiety when left alone, but adding another rescued dog to the home is an easy solution to this problem! Although as racing dogs, they are very fast, Greyhounds are not known for being excessively active. They are perfectly content to bed down on your couch, as long as they are given a nice walk or let out into a good-sized yard where they can run at least once a day. On walks, it is very easy to get a Greyhound to stay by your side, as that is how they are shown to prospective bettors at a track – they are promenaded around in a circle with their trainer for inspection. However, you must never be tempted to walk your Greyhound without a leash, as they have absolutely no street sense, and their strong prey drive will cause them to chase after small animals they may encounter. Greyhounds are not big barkers, so they are perfect for homes where neighbors are very close-by. In fact, they make good apartment dwellers in spite of their large size because they are quiet and because they are content to stay calm in a small space. They are definitely not good watch dogs as they have never met a stranger. Greyhounds are somewhat timid and shy; early socialization is required to get them used to a variety of noises and people. Training can help build the dog’s confidence. These dogs must be kept indoors, as they don’t have much body fat or fur to help them regulate their body temperature. They are susceptible to extreme environmental temperatures and may appreciate a sweater for those cold winter days. How do Greyhounds run so fast? Everything about the Greyhound contributes to his speed. The bone structure is lightweight, the spine is extremely flexible, the muscles are well-developed, and the chest cavity is large enough to contain the largest heart of any breed. The muscles of a dog are divided into fast-twitch fibers and slow-twitch fibers, and Greyhounds have a higher percentage of the fast-twitch variety than any other breed. This makes them good sprinters, but not great marathoners. They can, however, maintain speeds up to 30 miles an hour for as long as a mile. His long powerful legs move in a motion described as a “double-suspension rotary gallop.” All four feet are off the ground at the same time, with the legs first contracting and then extending before the feet hit the ground again. With this stride, this fastest of all dogs can reach speeds of nearly 45 miles per hour. The current problems in Greyhound racing have arisen primarily as a result of competition within the gaming industry. Dog racing must compete with horse racing, online gambling, casinos and even state lotteries for the gambler’s money. As dog track revenue has decreased, so has the treatment of the dogs working there. News stories often highlight miserable treatment, while race track owners contend that they would never mistreat the very dogs that are their cash cows. The majority of Greyhounds are bred on farms which feed the racing industry. Dogs are registered with the National Greyhound Association and issued a Bertillon card for identification. The card lists 56 points of identifying data and carries a unique number to prevent dogs from being fraudulently switched at the racetrack. The Bertillon identification number is also tattooed on the dog’s ear. Dogs are sorted out according to speed, temperament, and health as to those who may succeed at racing and those who likely won’t. Those who are unlikely to be competitive may be euthanized or sent to rescue organizations for eventual adoption. Dogs who do enter the racing industry generally run for two to five years before being retired, unless they become injured first. What special precautions need to be taken with Greyhounds? Greyhounds do not handle anesthesia like other breeds do because they have lower levels of the liver enzymes responsible for metabolizing these drugs. Spend some time interviewing veterinarians to make sure the one you choose has experience treating Greyhounds before you decide on one. In addition to problems with anesthesia, blood tests in Greyhounds will return different results than those in other dogs. In order to carry the maximum amount of oxygen to racing muscles, Greyhounds have more red blood cells than other breeds. In addition, they also have a lower platelet count. Greyhounds are also very sensitive to insecticides and should not be exposed to flea collars or flea sprays unless they are pyrethrin-based. Is the Greyhound the right pet for me? If you are looking for the warm feeling that comes from adopting an animal in need, you may very well be looking for a Greyhound. You must have the patience required to help the dog recover from any mistreatment he may have suffered during his racing life, and you need to commit to providing adequate daily exercise. However, you do not have to have a large yard or even a large home to have a Greyhound. They make excellent pets and will get along well with your entire family. 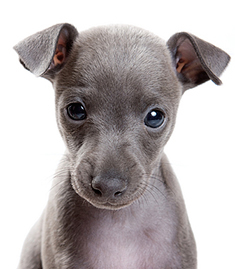 Find Greyhound Puppies with our Free Breeder search!